Historians reflect upon the past in order to illuminate the present and make wise decisions about our future. The success of Nazi fascism depended in large part upon the suppression of free speech and the absolute control of the press as a vehicle for propaganda. Many German journalists collaborated, some resisted. Foreign correspondents struggled to report what they saw without becoming unwilling mouthpieces for the regime. This talk will examine the process by which the Nazis assaulted, suppressed, and replaced the free press, as well as tell the stories of German and American journalists who dared to criticize the Führer and his party. The history of journalists under the Third Reich is of profound importance for us today at a time when journalists and the freedom of the press are once again under threat from nationalists movements and authoritarian leaders worldwide. 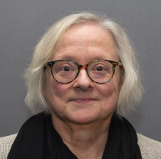 Ann Millin, Ph.D. is the 2018-2019 Ida E. K ing Distinguished Visiting Professor of Holocaust and Genocide Studies at the Sara and Sam Schoffer Holocaust Center at Stockton University. She was previously the Historian in the Educational Initiatives Division of the United States Holocaust Memorial Museum’s Levine Family Institute for Holocaust Education, Washington, D.C.
Co-sponsored by the Syracuse University Humanities Center, Lender Center for Social Justice, Department of History, Jewish Studies Program, Media & Education Program, and Department of Languages, Literatures, and Linguistics. Ann will also present a seminar for students on Thursday, February 7. Free and open to the public. Parking available in the Harrison lot (between University Ave and S Crouse Ave). Communication Access Realtime Translation (CART) will be provided. If you have additional accommodation requests, please contact suschoolofed@syr.edu or 315.443.4696 by January 28. The minor in Atrocity Studies and the Practices of Social Justice is supported by Lauri ’77 and Jeffrey Zell ’77, The William Zell Family Foundation, and JM Zell Partners, Ltd.